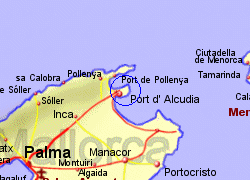 Map of the Alcudia Ferry Port area. 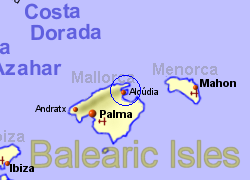 This is a small port at Puerto d'Alcúdia, in a natural bay near the north east corner of Mallorca Island, approximately 55km north east of the capital, Palma. 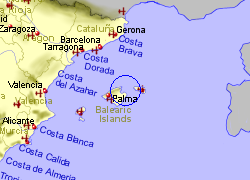 The port and town are well connected to the islands capital, Palma via the Ma13 trunk road running across the islands centre. The 55Km journey is likely to take around 45 minute by car. A bus service runs between the port and Palma de Mallorca every 30 to 60 minutes during the day, with a journey time of an hour and 15 minutes. Operated by Balearia with up to 15 crossings per week, crossing time 2hrs. Operated by Balearia with up to 7 crossings per week, crossing time 6 1/2hrs.